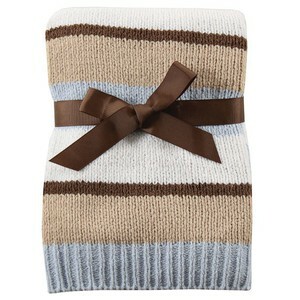 Hudson Baby Striped Chenille Blanket is a luxurious and elegant blanket from our premium Hudson Baby collection. Made with bold stripes and chenille style, this blanket is soft and gentle on baby's skin, but durable and machine washable for everyday use. 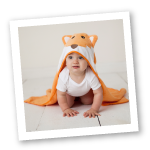 Our blanket measures a generous 30 x 40 inches, so it is perfect for sleeping, swaddling, cuddling, belly time, or even as a stroller or car seat cover. This item arrives with a gift ribbon tied around so it is ready to give with no extra wrapping necessary! Perfect for last minute gift ideas! It was never said in description that it is 100% polyester. Or else I wouldn't have gone for it.